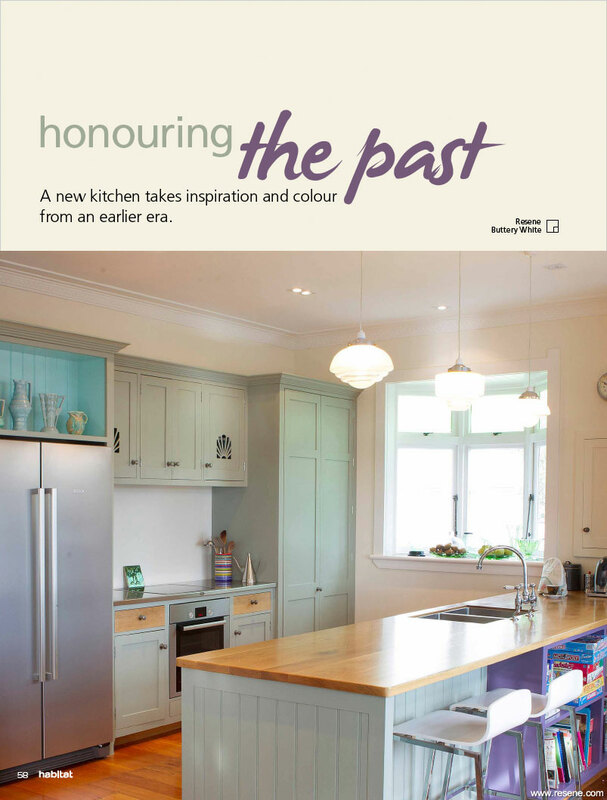 A new kitchen takes inspiration and colour from an earlier era. Converting a ‘rabbit warren’ of tiny rooms into one streamlined space mightn’t be rocket science, but where Cheryl Farthing and Jon Kirk’s recently completed kitchen and family room stands out is in the way they have repurposed the original design features of their 1920s bungalow… but with modern manufacturing techniques and interesting colour combinations. Honouring the past may have been central to the renovation but so was being environmentally friendly for the future good of the planet. 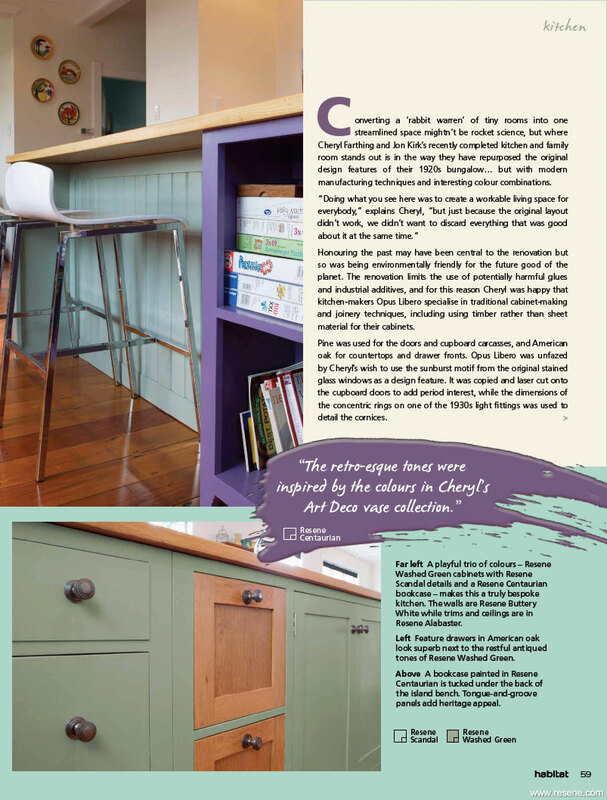 The renovation limits the use of potentially harmful glues and industrial additives, and for this reason Cheryl was happy that kitchen-makers Opus Libero specialise in traditional cabinet-making and joinery techniques, including using timber rather than sheet material for their cabinets. Pine was used for the doors and cupboard carcasses, and American oak for countertops and drawer fronts. Opus Libero was unfazed by Cheryl’s wish to use the sunburst motif from the original stained glass windows as a design feature. It was copied and laser cut onto the cupboard doors to add period interest, while the dimensions of the concentric rings on one of the 1930s light fittings was used to detail the cornices. 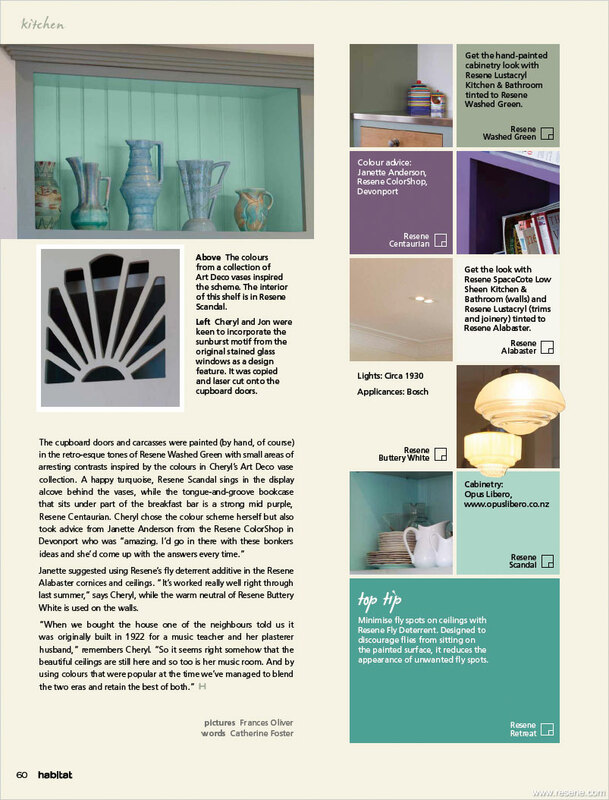 Janette suggested using Resene’s fly deterrent additive in the Resene Alabaster cornices and ceilings. “It’s worked really well right through last summer,” says Cheryl, while the warm neutral of Resene Buttery White is used on the walls. “When we bought the house one of the neighbours told us it was originally built in 1922 for a music teacher and her plasterer husband,” remembers Cheryl. “So it seems right somehow that the beautiful ceilings are still here and so too is her music room. And by using colours that were popular at the time we’ve managed to blend the two eras and retain the best of both. Minimise fly spots on ceilings with Resene Fly Deterrent. Designed to discourage flies from sitting on the painted surface, it reduces the appearance of unwanted fly spots.